How are y'all doing today! I shall explain my loves. In case you didn't know, I am originally Nigerian, and I was born in Nigeria. Every October 1st Nigeria Celebrates the day we gained Independence from the United Kingdom. 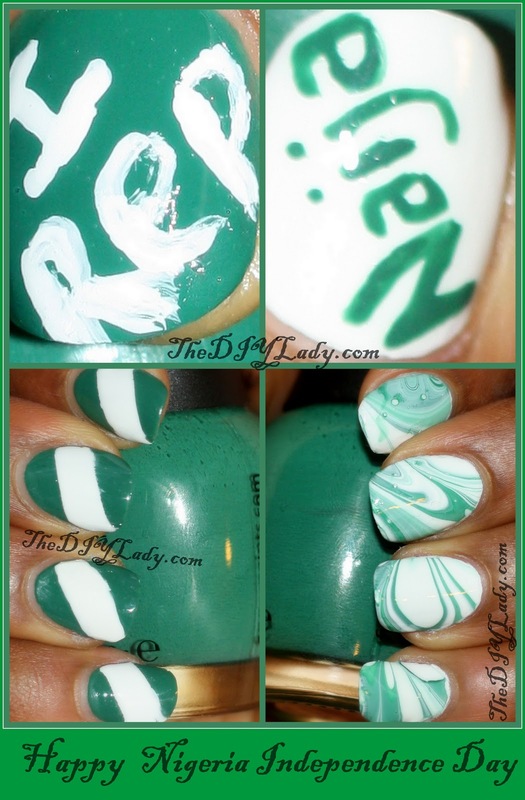 And of course I had to create a mani to wish Nigeria and Nigerians a Happy Independence Day. Alright, School's over.. let's get to the fun part of Today's post! Nigeria's Flag is GREEN, WHITE, GREEN, so I just had to figure out EXACTLY what I wanted to do with those colors. Here is my result!!! I went all out on my left hand and did a water marble with the two colors. Then on my Right hand, I did a regular Tape mani that resembles the Flag of Nigeria. On My thumbs, I wrote out "I Rep" and "Naija". Meaning, I Represent Nigeria!!! Individual Pictures of both hands. Right Hand: Nigerian Flag. Simple Tape Mani. Love the result, and I must mention the Polishes I used. The green is Finger Paint - Go Van Gogh. The white is Kleancolor - White. Left Hand: I used the same colors for my left hand, and Water Marbled. OMG, Please, please, Can I Scream ABOUT HOW EXCITED I AM ABOUT THE RESULT OF MY WATER MARBLE??! But But... Yes, I did a fairly decent water marbling. I'm beyond excited. That's it for my Naija Independence Day Mani guys. Are any of you out there Nigerians? Is anyone a Dual Citizen? Were you born in one country and now a Citizen of another? Share with me if you want.... I Love reading these things. I was born in Nigeria, I Live, Breathe, Speak, Eat Nigeria.. lol.. and I'm a Citizen of America... Love Both Countries so dearly, so don't even ask me to choose. LOL... (That's why I made sure to do a 4th of July Mani). Happy Independence Day to Nigeria Once Again. May you Live Long and I pray all shall be well with you. Till Later darlings, God Bless. Wow this is so rad! omg I cant believe it! loool I mean it in a good way I wanted to do a naija mani too since my boyfriend of 3 going in 4 years is from Nigeria too (Yoruba). I learned to cook Egusi soup and I understand broken English but it's so hard for me to speak, Happy 9ja independance day to you :) We dey! Egusi soup?? haaa, say it ain't so. Hahahaha.. I'm happy! Wooooooooooooooooooooooooooooooow!!! O.O Water marbling is absolutely PERFECT! I wish I could do that!!! The others manis are great too!!! Thanks. I love the marbling too. I am so glad with the result. You should watch youtube tutorials. I'm sure you'll get it. That water marble is absolutely gorgeous!!! Thanks. The marbling made me proud too. This is so fabulous! Your water marble is exceptionally good, I want to do it too! Awesome! This Naija babe is hiding in shame bc I didn't even think of doing a mani, which is really sad bc green is my fave nail color. Hope your independence day was good! wow the water marbling looks amazing!! !